The lead voice cast from the first film returns, including Bill Hader as inventor Flint Lockwood; Anna Faris as brainy weather girl Sam Sparks; James Caan as Flint's technophobic dad, Tim Lockwood; Andy Samberg as Swallow Falls' local celebrity `Baby' Brent; Neil Patrick Harris as Steve the gummy bear-loving monkey; and Benjamin Bratt as Sam's mild mannered cameraman Manny. In addition, Terry Crews joins the cast to take on the role of Earl, the town cop. 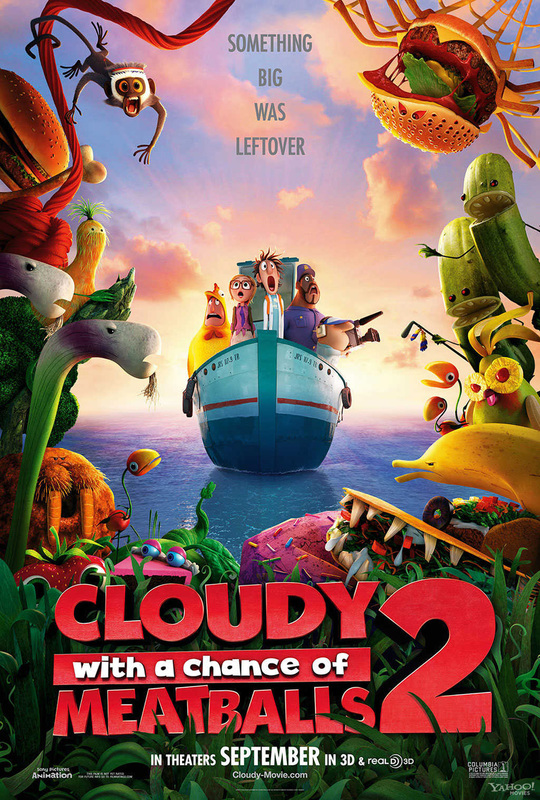 “Cloudy With a Chance of Meatballs 2” picks up where the original left off. Inventor Flint Lockwood's genius is finally being recognized as he's invited by his idol Chester V (Will Forte) to join The Live Corp Company, where the best and brightest inventors in the world create technologies for the betterment of mankind. Chester's right-hand-gal -- and one of his greatest inventions -- is Barb (Kristen Schaal), a highly evolved orangutan with a human brain, who is also devious, manipulative and likes to wear lipstick. It's always been Flint's dream to be recognized as a great inventor, but everything changes when he discovers that his most infamous machine -- which turns water into food -- is still operating and is now creating mutant food beasts. With the fate of humanity in his hands, Flint and his friends must embark on a dangerously delicious mission, battling hungry tacodiles, shrimpanzees, apple pie-thons, double bacon cheespiders and other food creatures to save the world – again! Opening soon across the Philippines, “Cloudy With a Chance of Meatballs 2” will be distributed by Columbia Pictures, local office of Sony Pictures Releasing International.